Tomorrow we head back to NM...a drive of almost 1,000 miles. I love to joke about how I had to move 1,000 east to live in The West. Curious. 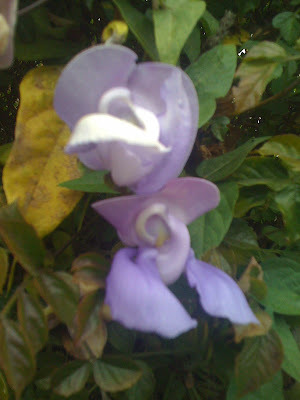 My friend Liz and I were walking in the last day or so and found these flowers draped over a fence. I'm not quite sure what they are, but they caught my fancy. Note the camera shake. Sorry. It has been a good trip, but now it's time to go home and jump start my other life again (the one that doesn't include Starbucks every morning and frozen yogurts every afternoon). 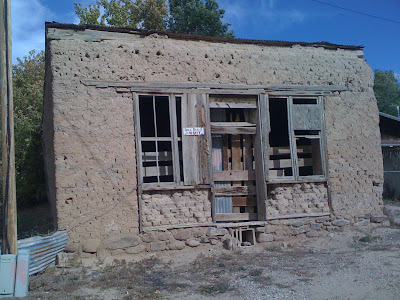 Thought I'd share a photo of this little Taos Fixer Upper, just for grins (check out the sign). I am moving in that little house tomorrow!